“The materials create the mood in rooms”. 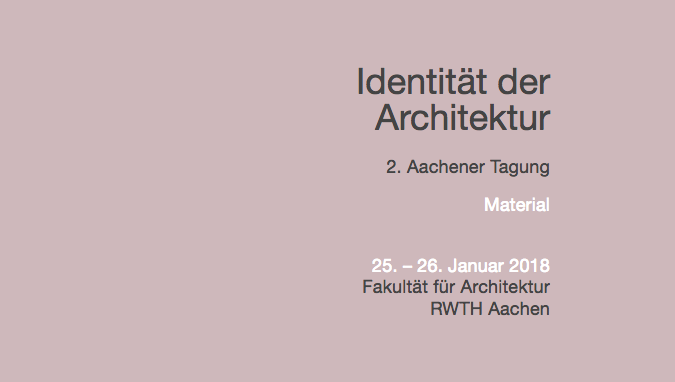 The second conference in Aachen on the Identity of Architecture will again look at one key feature of architecture – this time the material. The 2017 symposium was all about the location and therefore the context, this year’s one is about building material. Over 30 renowned architecture firms from German-speaking countries will be presenting their projects based on the event’s theme and inviting discussion. RWTH Aachen University specified nuanced issues on three subtopics: material and architecture, material and design plus material and construction. Some of the new speakers are Gigon Guyer, Staab Architekten or Rapp + Rapp, as well as a lot of old hands such as Kleihues+Kleihues, Modulorbeat, ROBERTNEUN or Hild und K.
Wilkhahn will again be supporting the conference that will take place this year on 25 and 26 January 2018. The cost will be €80 per day for full payers, with discounted tickets for students and members of RWTH. The price includes the conference, food and drink and taxes. Four further education credits can be issued for each day of the event.